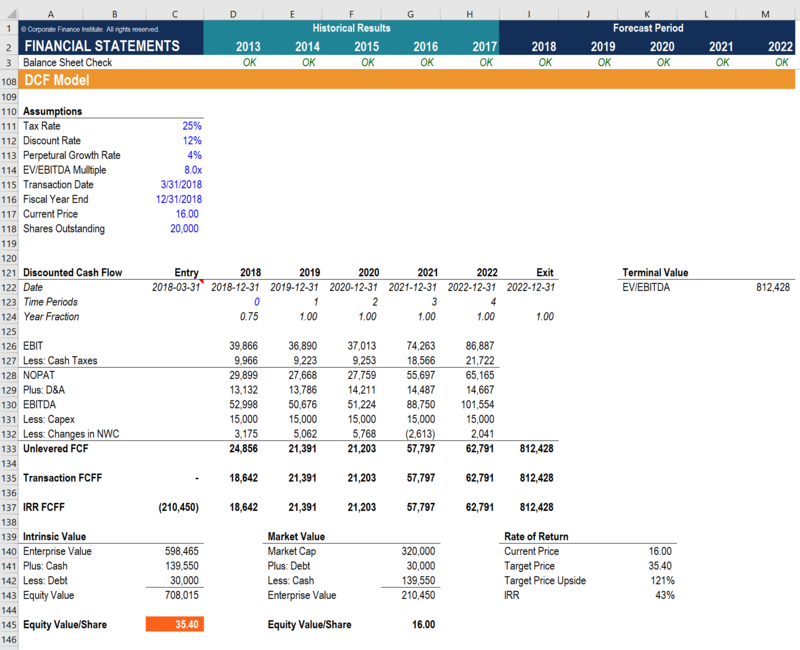 What terminal value is, how to calculate it, and how it's used in a DCF analysis. What is the DCF Terminal Value Formula? Terminal value is the estimated value of a business beyond the explicit forecast period. It is a critical part of the financial modelTypes of Financial ModelsThe most common types of financial models include: 3 statement model, DCF model, M&A model, LBO model, budget model. Discover the top 10 types of Excel models in this detailed guide, including images and examples of each. Financial modeling is performed for many reasons including to value a business, raise money as it typically makes up a large percentage of the total value of a business. 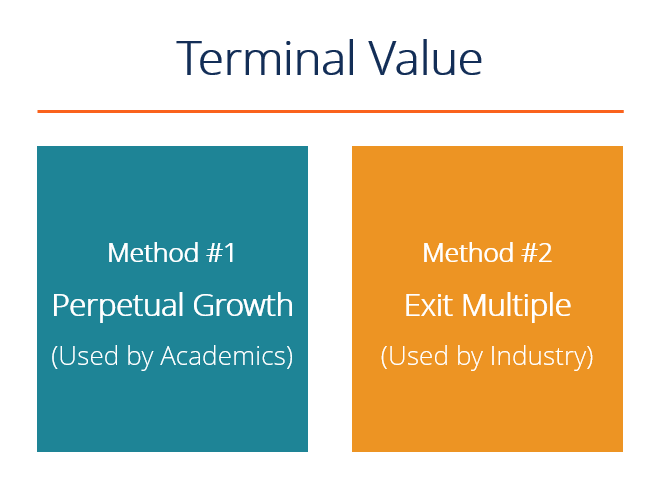 There are two approaches to the terminal value formula: (1) perpetual growth, and (2) exit multiple. Image: CFI’s Business Valuation Course. Why is a Terminal Value Used? When building a Discounted Cash Flow / DCF model there are two major components: (1) the forecast period and (2) the terminal value. The forecast period is typically 3-5 years for a normal business (but can be much longer in some types of businesses, like oil and gas or mining) because this is a reasonable amount of time to make detailed assumptions for. Anything beyond that becomes a real guessing game, which is where the terminal value comes in. 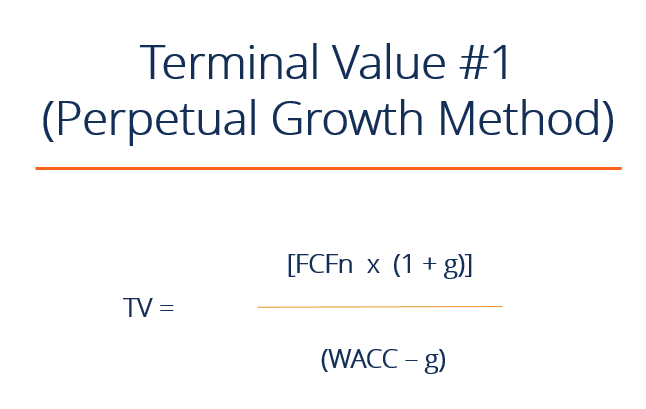 What is the Perpetual Growth DCF Terminal Value Formula? 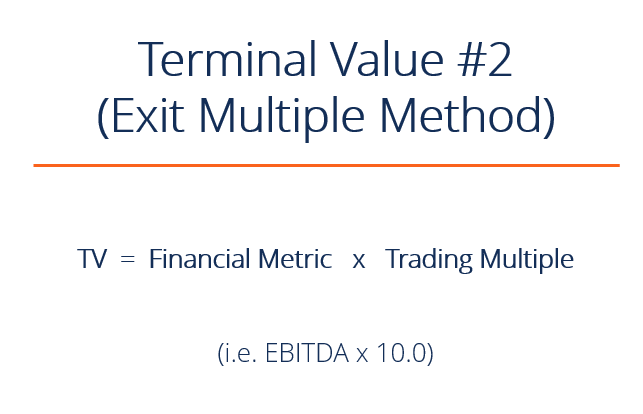 What is the Exit Multiple DCF Terminal Value Formula? Which Terminal Value Method is More Common? The exit multiple approach is more common among industry professionals as they prefer to compare the value of a businessValuation MethodsWhen valuing a company as a going concern there are three main valuation methods used: DCF analysis, comparable companies, and precedent transactions. These methods of valuation are used in investment banking, equity research, private equity, corporate development, mergers & acquisitions, leveraged buyouts and finance to something they can observe in the market. Among academics, you will hear more talk about the perpetual growth model since it has more theory behind it. Some industry practitioners will take a hybrid approach and use an average of both. Below is an example of a DCF Model with a terminal value formula that uses the Exit Multiple approach. The model assumes an 8.0x EV/EBITDAEV/EBITDAEV/EBITDA is used in valuation to compare the value of similar businesses by evaluating their Enterprise Value (EV) to EBITDA multiple relative to an average. In this guide, we will break down the EV/EBTIDA multiple into its various components, and walk you through how to calculate it step by step sale of the business that closes on 12/31/2022. As you will notice, the terminal value represents a very large proportion of the total Free Cash Flow to the Firm (FCFF)ValuationFree valuation guides to learn the most important concepts at your own pace. These articles will teach you business valuation best practices and how to value a company using comparable company analysis, discounted cash flow (DCF) modeling, and precedent transactions, as used in investment banking, equity research,. In fact, it represents approximately three times as much cash flow as the forecast period. For this reason, DCF models are very sensitive to assumptions that are made about terminal value. A common way to help represent this is through sensitivity analysisWhat is Sensitivity Analysis?Sensitivity Analysis is a tool used in financial modeling to analyze how the different values for a set of independent variables affect a dependent variable under certain specific conditions. Sensitivity Analysis is performed in Excel to asses risks, measure potential outcomes, and plan for an uncertain future. Image: CFI’s Financial Modeling Course. Below is a short video tutorial that explains how to calculate TV step by step in Excel. This example is taken from CFI’s financial modeling courses. DCF analysis – infographicDCF Analysis InfographicHow discounted cash flow (DCF) really work. This DCF analysis infographic walks through the various steps involved in building a DCF model in Excel.